A post which has no Linux, not much guitar, and attempts to persuade you to do something pretty boring. Last month I read a book which set me thinking about what happens when you learn to read music. One discussion that often comes up online, among guitarists at least (who also have the simpler tablature), is whether you should learn to read music. This is a question that often gets asked, not infrequently with the subtext 'clearly my natural musical genius means skipping this tedious step wont prevent me becoming a rock god'. 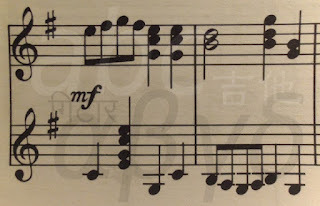 I write this as someone who knows what the dots mean, but still has to figure out the key signature or an individual chord. Pre-reader For the first five years of life children learn their language. They acquire thousands of words and grammatical rules. This process will continue through and be reinforced by the following stages. Novice reader A lot happens at this stage, learning letters correspond to sounds, correspondingly that words are made up of sounds. Recognising orthographic patterns (in English, things like 'eng', 'th', 'sh' and so on). Understanding different meanings of words. Three areas of the brain are involved, the visual system, semantic (meanings) and language comprehension areas, and parts of the frontal lobes involved in memory and speech. Decoding This is a semi-fluent stage where reading becomes smoother. In English this involves recognising larger patterns (e.g. how 'ea' is different in dear, bear, reap, head) and morphemes-the parts (stems, prefixes, suffixes) of words- for example 'sing' and -s, -er in sing-s and sing-er (or guitar, guitar-s, guitar-ist). Why am I bothering with all this? The point is that as those skills improve the brain becomes more efficient at the basics. The activation regions in the visual and recognition areas actually become smaller in fluent readers as the brain begins to get better at those tasks until all the above things happen automatically. What starts to happen then is the interesting bit. Firstly 'automatic' by itself is pretty amazing, a fluent reader looking at a word is prompted with its meaning(s) without having to think about it. As far as Wolf is concerned this is key to reading: freeing the reader up to think about what they're reading rather than how (when you're playing tennis you don't want to be concentrating on breathing in and out). Further, though the visual and association areas are less activated as they work less hard, different regions of the brain start to activate. An 'expert' reader (basically someone capable of reading a novel) will involve different parts of their brain including large parts of the left and right language areas and deep-seated areas related to emotion. Lastly, a very interesting nugget that takes us right back to the start... a study in rural Portugal comparing literate and illiterate people found only the literate individuals were able to identify phonemes in speech (e.g. the 'b' in 'birth') and the illiterate subjects had difficulty repeating nonsense words, rather saying similar real words instead. So, to make some unfounded speculations about what this might mean for learning to read music. Reading is not a separate 'module' that you just plug into the input to language or auditory centres, it's a network process that uses those regions as an integral part and in practicing reading you exercise them. In the early stages it does focus on learning to recognise symbols and how they combine together and correspond to sounds (or in the case of writing systems like Chinese, words, and those use some different brain regions), but as fluency improves the visual and recognition side fades into the background and many other regions start to get more attention. During that learning process the learner is also exposed to many different words, usages and idioms and these all get taken on board. Automaticity also means the rest of the brain gets more time to process incoming information. Finally the practice and the exposure to material during learning contribute to improving the ability to understand what is read. It's not essential. For thousands of years people spoke their own languages fluently without being literate. We have some superstar musicians who admit they can't read music (did someone say Paul? ), the same way there were illiterate poets (Homer, there may still be some, but literacy is so widespread now it's less likely). And stage 1. above is learning thousands of words before learning a single letter (Wolf also says children who get exposed to more spoken language will have an easier time learning to read). Before recording, and particularly digital technology, written music was the only way for a learner to 'slow down' music, particularly to understand rhythm and see its parts the same way alphabetic and syllabic systems do for words. And, like for reading, new technologies might change things about the way we communicate and learn. But, if if what's true about reading language is true for music, I think the two things to take away are: knowing music is a good foundation for learning to read it, reading music will help you understand it. The Right Way Read Music (amazon) a good guide to the dashes and dots and basic theory (thanks to Alan Green at Guitar Noise for recommending it). Mel Bay's modern guitar method (Book 1 at amazon), uses only standard notation. The equivalent Hal Leonard books provide tablature and standard notation for some exercises and standard-notation only for others, maybe an easier compromise. Ear training (list of resources), after all you need to train your recognition of the music to match what's on the page. The Guitar Noise 'Theory without tears' lessons, including Nick Minnion's lessons (part 1, part 2, part 3).